2001 HWACHEON HI-ECO 31AA CNC LATHE, W/ 10’’ CHUCK, 5C COLLET NOSE, 3’’ BAR CAPACITY, 10 ATC, CHIP CONVEYOR, PARTS CATCHER, BAR FEED. FADAL VMC-4020 CNC VMC, CT-40, 21 ATC, 10,000 RPM W/ TSUDAKOMA 10’’ 4TH AXIS ROTARY TABLE. 2) MORI SEIKI MV 45/40 CNC VMC’S WITH YASNAC MX-1 ND MX-2 CONTROLS, CT 40, 20 ATC. 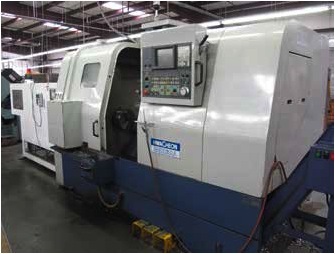 MORI SEIKI SL-2A CNC LATHE, WITH YASNAC 2000 B CONTROL, 8’’ CHUCK. MORI SEIKI SL-1A CNC LATHE, 6’’ CHUCK, YASNAC LX-1 CONTROL. 2) MATSUURA 500V CNC VMC’S, WITH YASNAC 3000 G CONTROLS, 16 ATC. OVER 10) NEW KURT VISES, MODEL D30, D80, PH400, DL400A. 2) REPUBLIC 14 X 40 ENGINE LATHE. REPUBLIC 16 X 40 ENGINE LATHE. 4) LAGUN MODEL FTV-1 MILLING MACHINES WITH DRO AND P.F, TRAVEL DIAL. GROB 18’’ VERTICAL BAND SAW WITH BLADE WELDER. HAAS 5C INDEXERS WITH SERVO CONTROL. LARGE SELECTION OF TOOL CABINETS, BENCHES, VISES AND SUPPORT. LARGE SELECTION OF INSPECTION TOOLS, ID MICS, CALIPERS, HEIGHT GAGES, AND SUPPORT. MICRO VU 14’’ OPTICAL COMPARATOR.